Fattoria Mancini is a family owned winery, established in 1861. 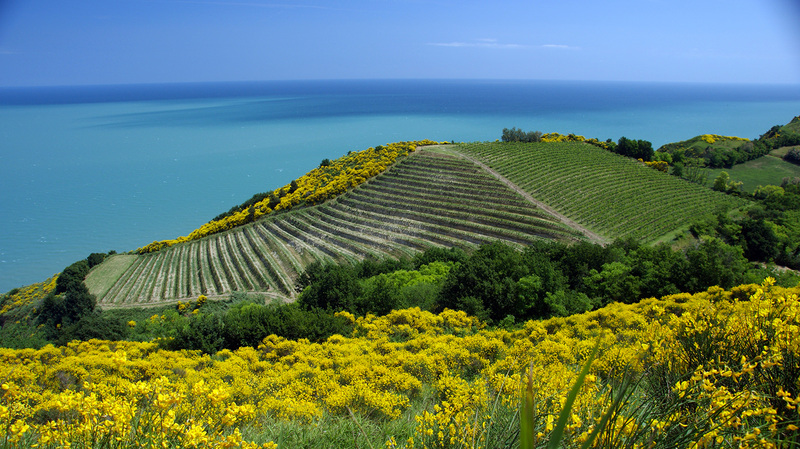 The vineyards, of around 20 hectares, are located in the Natural Park of Mount San Bartolo, at the very north of the Marche Region. They sit above the spectacular cliffs of Focara on the Adriatic coast, a few kilometres from the town of Pesaro. The cool microclimate of this stretch of north orientated coast and the calcareous sandstone soil allow the production of long lived wines with a great balance between structure, depth, freshness and elegance. The principal grape variety of Fattoria Mancini is Pinot Noir, introduced into this area at the start of the nineteenth century by the Napoleonic administration and preserved by the family for five generations of winegrowers. After two centuries of evolution and adaptation this particular Pinot Noir is now quite rightly considered a local grape. Other typical local grape varieties are also cultivated at Fattoria Mancini: Sangiovese, Ancellotta and Albanella - the typical and exclusive white grape variety of Pesaro. Being in the heart of a Natural Park, Fattoria Mancini has increasingly focused on sustainable viticulture; to avoid the use of chemical herbicides all the new vineyards have been projected for fully mechanical management of the soil and are fertilised with local compost. The Winery is only vinifying it’s own grapes.